On his fifth championship point, Rafael Nadal clinches his 11th French Open trophy. Nadal defeats Dominic Thiem 6-4, 6-3, 6-2 in two hours and 42 minutes. ​Dominic Thiem fought but could not regain the break he surrendered early in the set. Nadal holds for a 6-4, 6-3 lead. 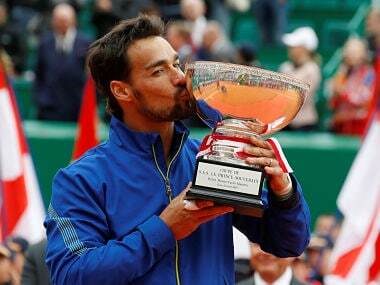 He's a set from his 11th Roland Garros title! Nadal is 95-0 when he wins the first set on clay in best-of-five. At Roland Garros, he is 77-0 when he wins first set. ​Nadal breaks for a second time in the opening set and takes it 6-4 after 57 minutes. When Nadal in a Grand Slam final wins the opening set: his record his 13-1 (only loss to Novak Djokovic in Aus Open final 2012). Dominic Thiem is one of only three players to have beaten Nadal three or more times on clay -- the others are Djokovic and Gaston Gaudio. The 24-year-old Austrian is on a 10-match winning streak having lifted the ATP title in Lyon the week before the French Open. Thiem will try to become only the second Austrian player – man or woman – to win a Grand Slam. Thiem's countryman Thomas Muster won the 1995 Roland Garros title. 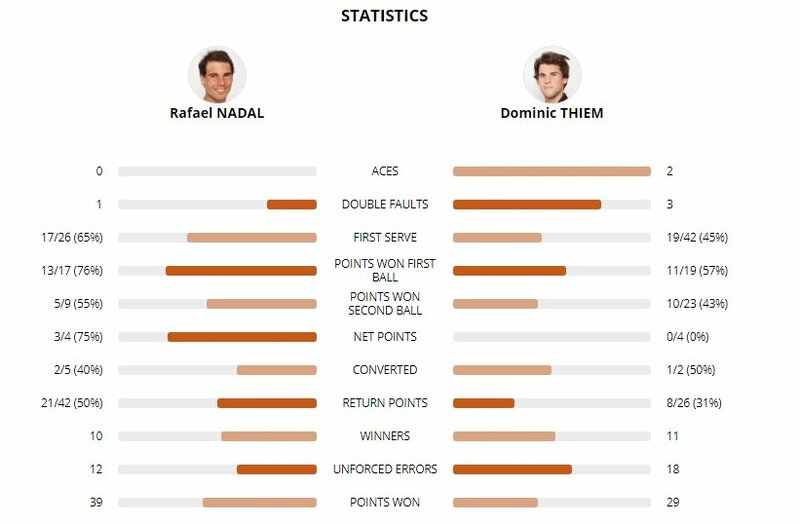 In 2018, Thiem and Nadal have played each other twice so far. At Monte Carlo, Nadal won 6-0, 6-2. At Madrid, Thiem won 7-5, 6-3. Dominic Thiem is attempting to do something that no other player has ever manager - defeat Rafael Nadal in the French Open final. But Thiem is the only player to have beaten Nadal on clay in the last two years, can he do it over a best-of-five-sets though? And with that, we bid aideu to Roland Garros! Thank you so much for following along. We will be back for Wimbledon. Rafael Nadal defeated Dominic Thiem 6-4, 6-3, 6-2 to win a record-extending 11th title at the French Open. Nadal becomes the second player in tennis history to win 11 singles titles at any Grand Slam tournament after Margaret Court, who claimed 11 Australian Open titles. Nadal will remain at the top of the ATP rankings ahead of Roger Federer. Nadal and Federer have won the past six Grand Slam tournaments between them. "I want to say well done to Dominic and all your team. It has been an honour to play with you, you are a great player. Keep going. I wish you all the very best. "I can't wait to say thanks to all my team and family. Everyone who is helping me day by day. Without you it is impossible. It is amazing. We spent some tough moments last year, so it's a dream to be with this trophy again." "Rafa, I just want to say well done. What you did and what you are doing is the most outstanding thing an athlete achievement in sport. Congratulations. It is amazing. Bravo. To me it's been still great two weeks. "I can still remember being 11 when you won here for the first time and I watched on the TV. So I never expected one day I would play the final, so I'm really happy. I loved the tournament. I hope that soon I will get a chance, maybe even against you. I will make a promise - hopefully next time at the ceremony I will say it in French!" Nadal very emotional as he lifts the trophy! He's in tears and the crowd continues to give him a standing ovation. What an incredible achievement by the Spaniard. The King of Clay celebrates after winning his 11th trophy! Nadal breaks again and will now come out and serve for the championship! 5-2. Extremely poor game littered with unforced errors from Thiem. But before Nadal serves, he calls for the trainer for one more time and gets his left arm massaged again. Here's some more news from what was bothering Nadal. And despite all those cramps, Nadal is playing some exquisite tennis. He holds to love for 4-2. Just two games away from his 11th French Open title. After Thiem holds, Nadal calls for a proper medical timeout and the trainer comes out and massages his arm. A very bizarre moment! Nadal seems to have a cramp in one of his fingers. He takes a break and calls for the trainer. He complains that he can't even hold his racquet, takes some pills and then goes on to hold serve comfortably for 3-1. That was very weird. Nadal hits his backhand with plenty of top spin into the corner and Thiem has to jump to even make a return. And then Nadal easily whips it into the court with his forehand to bring up BREAK POINT. Thiem saves it with a delicately-hit dropshot that for once Nadal can't chase down. DEUCE. Two HUGE forehands from Thiem down the line and it's advantage to the Austrian. Thiem fires an inside-out forehand but it sits up nicely for Nadal to return for a winner down the the line. DEUCE again. Ace down the tee and Thiem brings up another game point. Some vintage footwork from Nadal as he hits a devastating inside-out forehand winner - at 92mph while moving backwards - and it's DEUCE again. Thiem buries a forehand in the net and it's BREAK POINT for Nadal again. Thiem's forehand slice floats wide and he is broken. Easy hold from Nadal for 1-1. Nadal hits his first double fault of the match but that's the only point he drops in his service game. Thiem saves FOUR break points and holds for 1-0 to start the 3rd set. Uh-oh. Thiem falls behind 0-40 on his serve in the very first game of the third set. Forehand winner down the line from Thiem saves the first break point! 15-40. And then he fires a winner down the other line! 30-40. 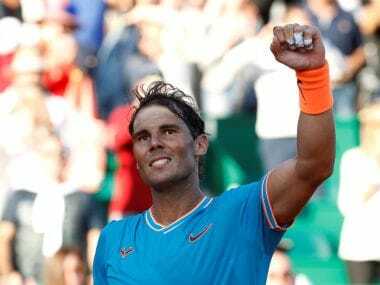 Nadal blasts a forehand long and Thiem fist pumps in joy! Deuce. An unforced error from Thiem gifts Nadal another break point but the Spanaird gifts it right back. Deuce again. Two points later, Thiem eventually holds and his coach Gunther Bresnik leaps up to celebrate. Thiem might be trailing by two-sets-to-love but he is still fighting in this third set. Take a look at the stats from the second set. Thiem avoids getting broken and now Nadal will serve for a 2-0 lead. 3-5. Nadal quickly up 30-0. His first serve down the T goes wide. A short rally off the second serve and Thiem gets his first point as the Nadal forehand goes long. 30-15. A Thiem backhand hit wide helps Nadal take the second set 6-3 in 45 minutes. Nadal saves a break point and edges ahead 5-2. Thiem now serving to stay in the second set. 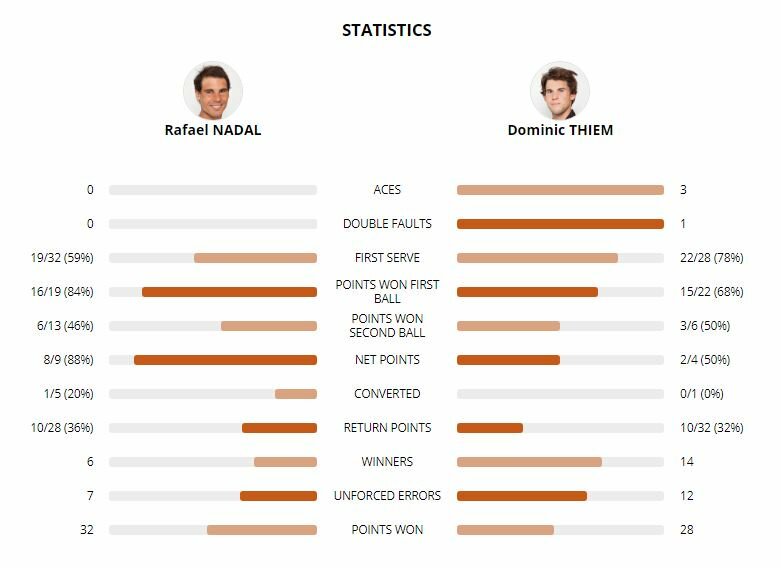 Thiem threw absolutely everything at Nadal in the previous game and still came up short. Nadal bossing at the net to kill any hopes that Thiem had. Two splendid dropshots help him save a break point and hold for 5-2. Small window of opportunity for Thiem at 0-30 on Nadal's serve but it's quickly snuffed out when the Spaniard wins a 17-shot rally with a winner. 15-30. Thiem's backhand flies long on the next point and it's 30-all. On game point, Thiem hits a massive forehand winner down the line but two points later, Nadal holds comfortably. Thiem must be beginning to wonder what he needs to do to break his opponent's serve as nothing is working at the moment. Nadal wins five straight games to jump ahead 3-0 before Thiem finally gets on the board in the second set. 3-1. The Austrian's body language is quite negative at the moment. This match has an air of finality. Can he do something to try and keep this competitive? He'll have to start by reducing the unforced errors from his racquet and forget about how the first set went. Thiem saves three break points in his first service game of the second set but can't save the fourth. He trails 0-2. This is the last thing that the Austrian would have wanted in this set. His chances get slimmer with every passing game. Looks like that botched volley from his previous set is still on his mind as he continues to commit unforced errors, including a double fault. Thiem wom only 45% of his first serve points in the first set. Take a look at all the other numbers as well. Thiem plays his worst game of the match and at exactly the wrong time. Broken at love to lose the first set, 6-4. Thiem missed a straight forward volley in the net on the first point and it was all downhill from there. He got more frustrated with every point that he lost and kept yelling at himself and at his box. Lost his focus right at the end after doing so well till that point in the set. Nadal now using his backhand slice to full advantage and he holds for 5-4. When the Spaniard hits his backhand down the line with sufficient top spin to Thiem's backhand, he wins the point nine times out of 10. Solid strategy. .
And look who's in the house to watch this match! He needs a few more of those to have a chance in this match. Now can he put some pressure on Nadal's serve to make this set even more interesting? Right time to do so at 4-4. Quick service hold from Nadal to move ahead to 4-3. 40 minutes into the men's singles final, it's 3-3. Thiem: 8 winners, 13 unforced errors. And the weather prediction says there are chances of rain later in the day. We might be here for a while! Thiem saves two break points and holds after a very long, tense service game. 3-3. Drama on Court Phillipe-Chatrier! At 40-30, Thiem doesn't play a Nadal return because he thinks it was out. Late "out" call from the linesman after Theim let it go. The chair umpire comes down to check the mark and says it was in! He gives the point to Nadal, as Thiem didn't attempt a play on it. Thiem understandably pissed and tries to argue as boos ring out in the stadium. Deuce. Two points later, Thiem saves a break point after a long rally with another punishing forehand. But Nadal gets one more break point after Thiem overcooks his return. At deuce, the 7th seed plays a wonderful rally and takes the point with beautiful hands to pick up a low-lunge volley. Brilliant tennis. After a long 13-minute service game, Thiem escapes with a hold. Check out that gorgeous lob! Nadal makes it 3-2, on serve. Nadal goes unpunished for a pretty bad dropshot as Thiem returns it right in his hitting zone and Nadal replies with an-inch perfect lob. Nadal overhits a forehand return and it's 40-30. A good body serve from Nadal helps him hold. 3-2. Thiem saves a break point and holds for 2-2. Thiem with two horror double faults in his service game which allows Nadal to bring up a break point. However, Thiem saves it under pressure and then wrestles out a hold for 2-2. This is the winner from Thiem which set up his break points. Thiem immediately breaks back for 1-2. Nadal hits a forehand long and it's 15-30 on his serve. Small opportunity for Thiem here! And Thiem responds well by whipping an absolute peach of a forehand into the corner that Nadal can't reach. TWO BREAK POINTS FOR THIEM! Nadal saves the first after a short rally which ends with Thiem shanking his forehand. But Thiem converts on the next one with a crushing forehand winner. It's back on serve, 2-2. Thiem opens up the court with an inside-out forehand but then misses the easy backhand down the line and it's two break points for Nadal. The Austrian nets his forehand on the next point and is broken. 2-0 to Nadal. Nadal serves first to start the match! And what a blistering start from the Spaniard! He holds at love with an emphatic putaway at the net. Three errors from Thiem in that game but Nadal has come out all guns blazing. Thiem wins the toss and elects to receive! The players are now warming up and we are minutes away from live action. Buckle up, folks! This promises to be an exciting final. This is what the two players are fighting for today -- La Coupe des Mousquetaires! Who do you think will win the men's singles final? #Thiem or #Nadal? Read our preview of the men's singles final in the link below. "When the two walk out to the Philippe-Chatrier on Sunday, Thiem will be the underdog, but a worthy challenger." Yet unlike the other hopefuls who've had the misfortune of crossing paths against Rafael Nadal on the red dirt of Roland Garros, Dominic Thiem is no pushover. 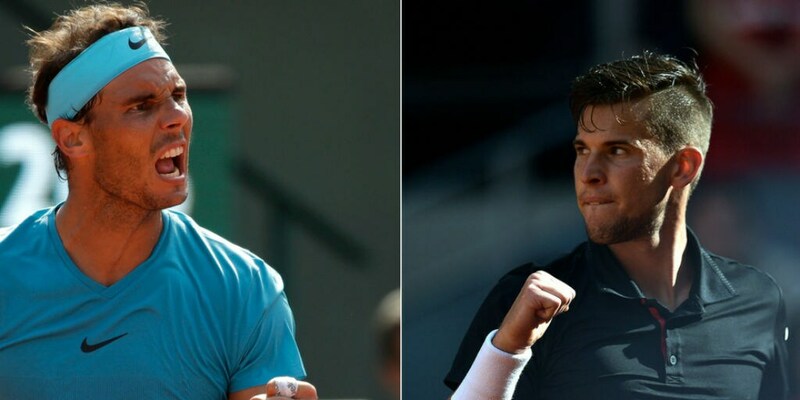 Austrian Dominic Thiem faces arguably the biggest challenge in sport, overcoming Rafael Nadal on the Court Philippe Chatrier clay, if he is to join the Grand Slam winners’ club on Sunday. Only two players have managed to beat Nadal at the French Open since he first bounded into Roland Garros in 2005 armed with a bulging left bicep, pirate pants and a pulverising brand of claycourt tennis the like of which had not been seen before. 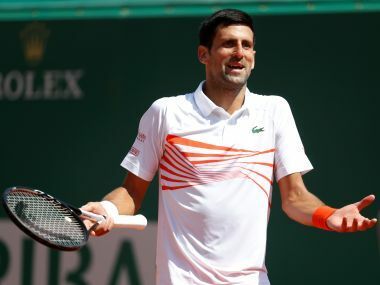 An 86th win on Sunday will give the 32-year-old Spaniard an 11th French Open title — a joint record for triumphs at a single Grand Slam along with Margaret Court who won 11 Australian Open trophies, albeit not all in the professional era. He is the only player to beat Nadal on clay in the past two years — in Rome last year and in Madrid last month — and this season no other player, not even the undisputed claycourt king, can count as many match wins on the red dirt. Plenty have gone in with sound tactical plans against the 16-times Grand Slam champion in Paris but when the forehand bombardment begins, the best-laid plans usually fall apart as was the case in Friday’s semi-final when Nadal thrashed Juan Martin del Potro who many thought posed a credible threat. Thiem is looking to become only the second Austrian player — man or woman — to win a Grand Slam title after Thomas Muster’s French Open victory in 1995.